Distance covered so far: 12,430 km, distance to go: 30 km, 3C, GMT +8. Sad to be leaving the Kerry, but up early for my journey to Shanghai. In the Shangri-La way, everything was a whir of efficiency at check out and I was soon deposited in a wifi enabled car and accompanied by Chris, the hotel concierge. 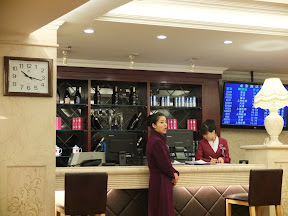 I discovered on the short journey to the station that this blog is actually blocked in China, but the hotel route their internet via Hong Kong, so as a result I have had no problems posting. 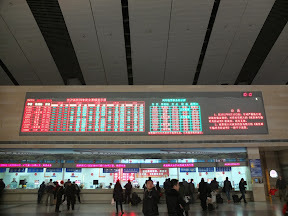 I hasten to add that I think it is Blogger that is banned, not my posts..
Beijing South is an impressive building (and the biggest train station in China) but yet so much easier to use than the sprawling Beijing Central station. I actually didn’t need the interpreter services of Chris at all – it was more clearly signed than most British airports! 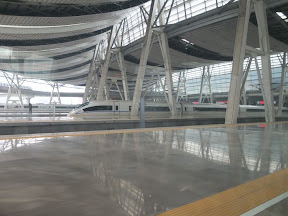 The investment and scale of the high speed rail network in China is amazing. On Tuesday this week they opened the new line from Beijing to Canton, cutting the journey time from 20 hours to just 8 hours. 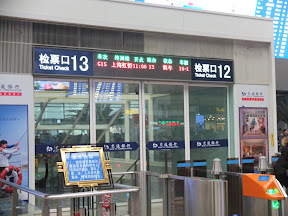 The line to Shanghai is similarly fast, covering over 1300 km in just 4 hours 45 minutes. The Trans-Siberian covered on average 1100 km per 24 hours! The G train that I travelled on had three classes – second class, first class and business class (the most expensive). If you travel in business class you get the “VIP” service package – lounge, food etc. The system at the station is that after going through a speedy security check as you enter the main station, there are a series of airport style gates for each train. These open 20-30 minutes before departure, and you show your ticket on entry (they didn’t ask to see my passport, but it’s number appears on my ticket). I think the station reminds me of an enormous version Stansted Airport (for all the right design reasons) and hope Sir Norman Foster would not be offended – i.e. you only have to walk about 100m forwards from entering the concourse to getting down onto the platform for your train, real functionality. After being left in the VIP lounge for an hour or so my porter collected me and fast tracked me to the front of a big queue. 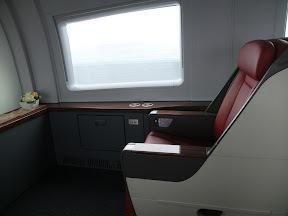 We took the lift down to the platform where he sped ahead to the very end of the train and deposited me in the sightseeing/quiet/VIP cabin – more the feel of a Gulfstream 4 than a train, with just five seats. There is so much leg room here that all my bags are in front of my seat and I can’t reach them with my legs. It reclines into a full flat bed and has a TV monitor (which I didn’t try or see anyone else using). Having heard about the sad passing of Gerry Anderson this week, the design of the inside of the cabin also reminded me of an Eagle from “Space 1999”- Look at the proportions of the window and the curve of the wall.. It would be nice to think that the designer was inspired by futuristic kids television! I popped out to take a few quick snaps, then I waited in my chair watching the LED panel ticking down the time to blast off. 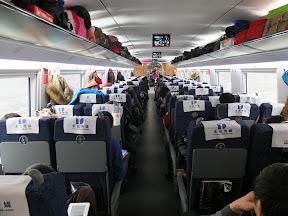 I was slightly alarmed that the pilot had not arrived at T-5 (he has to get in via the cabin) when it dawned on me that I was sat at the back of the train and not the front – Beijing South is not a terminus. So at 10.57 the doors slid closed and with the gentle whir of motors, three minutes early, we eased out of the station. The first few kilometres were a reduced speed, but within 10 minutes we were accelerating up to 300km/h and beyond. It was unnervingly smooth. I spent some time in the main business cabin, where I chose to have my lunch (seat 4F). There were just 12 seats here – it was a bit brighter, wider and more open than the “rocket style” of the nose section, with three seats across. Both are very nice places to be. Lunch was simple but tasty. There was no choice, it was a beef and duck medley with noodle soup. No tea or coffee, just water or Coke. As a recently fully trained Trans-Sib survivor, I noticed that there was the modern equivalent of a samovar at the end of first class, so no problem if you bring your own noodles. 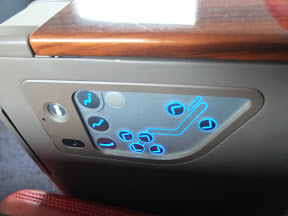 Here’s a picture of first class, which looked quite popular. I had thought that the train was a non stop service, but in fact we stopped briefly at Jinan West and later Nanjing South. The trip is so fast that you watch the outside temperature rise as you travel south. I let countryside the flash past to a soundtrack of “The Very Best of Japan”, which seemed to fit the surroundings rather well. 1) As I understand it, some trains don’t have a full business class, just first class seats for premium passengers. It’s worth making sure your ticket fare looks like the right one. Mine cost 1700 RMB (about £170) + service charge from ChinaTicketsNet. 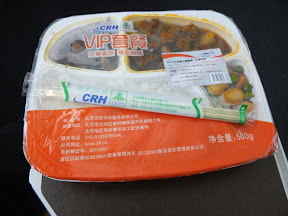 I ordered it before I left home and it was delivered by courier to my hotel in Beijing without any difficulty. 2) Some trains (the ones with no separate business class carriage) have a very small number of seats that are the same as business class but right at the front of the train (like my seat) with an opaque view into “the cockpit”. 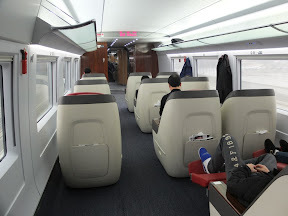 These are sometimes called “VIP” or “sightseeing” class, but it confuses the system described above, as they are also treated as business class on trains that have a business class cabin. I think its about half of all the trains – its easy to spot because there is no business class fare available on that train from the ticket agent eg ChinaTicketsNet. My conclusion is that you will unlikely to be able to buy “sightseeing” or “VIP” seats on trains even with business class fares available, as the agents don’t sell “sightseeing class” as a separate product (probably owing to all the confusion and the small number of seats). I would add that the normal business class carriage is nearly identical, so no real need to worry about all this..
3) My business class ticket, by chance, allocated me a seat in a sightseeing section at the very end of the train, in a business class carriage (carriage 16, Richard Burton style – seat 1A) – there are only five seats, and I note one pair are placed together as a sort of love seat with no armrest in the middle 2A/B. A bit scary if you had to share that with someone that you didn’t know! It’s all a little bit confusing, so I hope that’s clear! We arrived on time into a misty murky Shanghai Hongquai that is on the same scale as Beijing South – modern and massive! 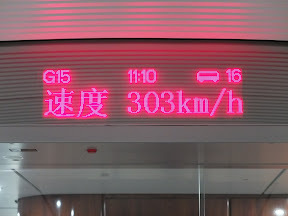 I’m stopping in Shanghai for a couple of days now – my final leg, only 30km, but the fastest 30km currently possible by train on Earth, is on New Year’s Eve – the Maglev. Wonderfull reading Mr "T",Wonderfull experience , congratulations on reaching your destination safelly. All your lessons learned this last few days and you will still not understand the workings of the "A.C.O" 🙂 ,, Safe onward trip and a very happy new year Mr T . Kind regards , OT .